VERY NICE PIE SHAPE LOT WITH BRICK/VINYL HOME 2/2. 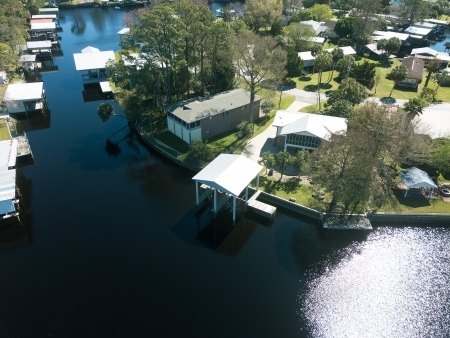 110' seawall waterfront YOU HAVE A LARGE BOAT HOUSE WITH TWO ELECTRIC LIFTS,ALSO DOCKS TO TIE UP SIX BOATS.YOU ARE ON LAKE HOLIDAY,JUST A SHORT RIDE OUT THE CANALS TO THE RIVER AND THEN INTO THE GULF FOR GREAT FISHING.GREAT VIEWS OF THE LAKE FROM YOUR SCREENED IN DECK 12x24 Tiled floors downstairs, vinyl and pergo upstairs. DOCK OVER THE WATER TO SIT AND CATCH FISH. ENJOY THE SUWANNEE FISHING OR JUST COME SIT BACK AND RELAX.CALL FOR APPOINTMENT TO SEE THIS HOME. Biggest body of water in Suwannee. Wide deep body of water.